Its another gorgeous release from the greatest company on this planet! The Patchwork Daisy Collection is so beautiful! Reminisce of days gone by when laughter filled quilting bees were a treasured outing filled with chatter, decadent dainties and a great sense of accomplishment at the end of the day! Little girls admiring beautiful hand-stitched quilts coming together under the direction of the hands of skillful seamstresses, as they imagine the day that they too will learn the secrets of perfect stitching and delicate embroidery. Let your mind wander back the days when pretty hand-stitched blankets lined Grandma’s clothes line, flapping in the breeze as daisies danced gently in the background! 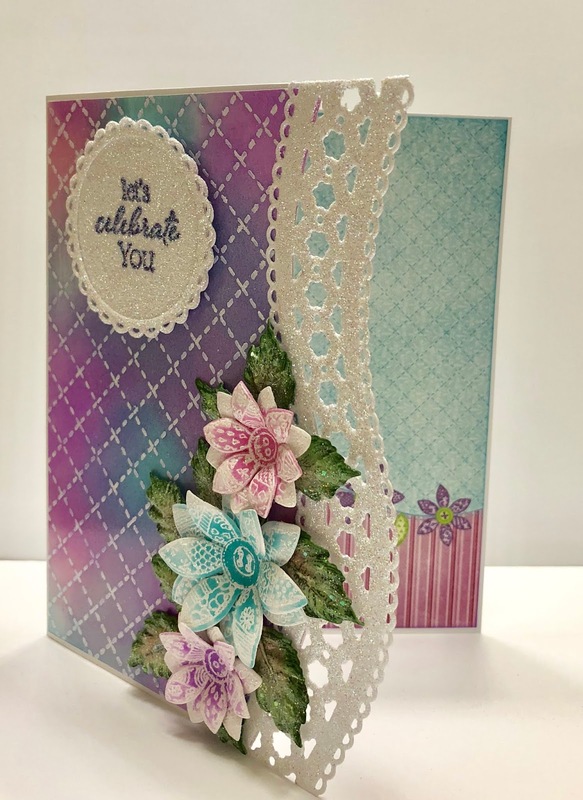 Join us as we remember simpler times with the old fashioned Patchwork Daisy Collection! Immerse yourself in designer papers filled with soft and gentle hues reminiscent of purple lavender filled fields, warm sunshine yellows, clear sky blues, and beautiful wildflower pinks. Feel the gentle warmth of a hand stitched quilt as you are embraced by dainty illustrations of tranquil florals, decorative patterns and delicate patchwork panels similar to those on Grandma’s finest coverlet! A wonderful array of beautifully detailed cling stamps, along with coordinating dies provide endless “embroidered and quilted” embellishments to adorn all of your handcrafted projects…from dainty daisy florals delicately illustrated, appearing to have been cut from decorative quilt blocks and then hand-stitched, to a wonderful assortment of graceful eyelet trim borders perfectly designed for “finishing” your handcrafted projects! The perfect assembling of decorative papers, clings stamps and coordinating dies to blend with the previously released Buttons and Blooms Collection! So, gather your crafty friends around the kitchen table…it’s time to laugh, snack, reminisce, and show off your creative handiwork! Instructions:Card size is 6 x 5”. Score and fold 10 x 6” white cardstock at 5” on the long side. Using the plain edge die from the Fleur Border Basics die set, cut the front edge of the card at 4” at the widest point. Stamp the Hand-stitched Background Cling Stamp on 4 7/8 x 5 7/8” glossy white cardstock using VersaMark ink. 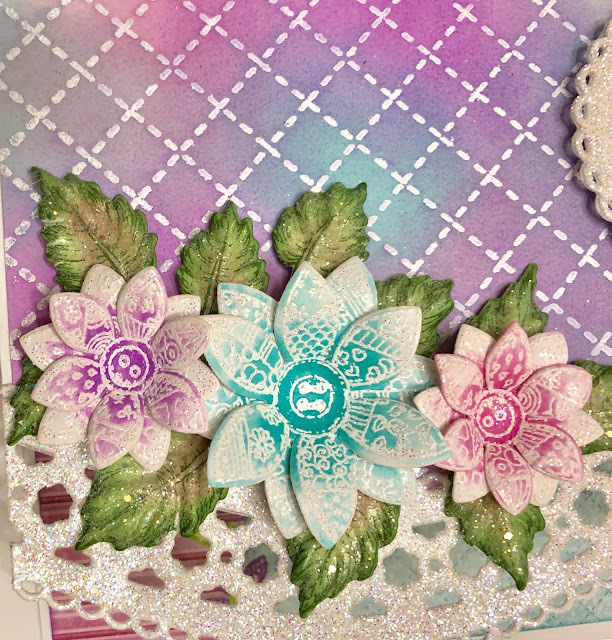 Sprinkle with WOW Sparkling Snow Embossing Glitter and heat set using the Heat It Tool. 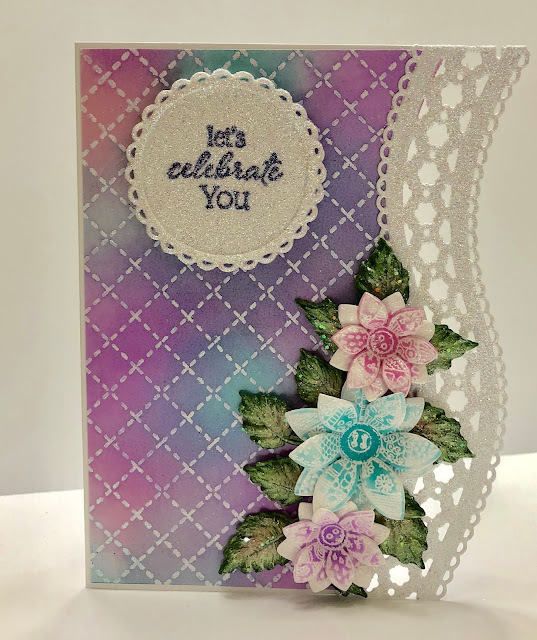 Using the Ranger Ink Blending Tool, color the glossy cardstock with Distress Oxide Inks – Wilted Violet, Picked Raspberry and Peacock Feathers. Wipe it down with a clean cloth to clean the ink off of the embossed stiches. Diecut the edge with the plain edge die from the Fleur Border Basics die set. Stamp the sentiment on white cardstock using Archival Jet Black ink, diecut using the Eyelet Circle die from the Furry-Tailed Folic Die, Diecut a border using the outer and inner dies from the same set, adhere, sponge with dries clear adhesive and sprinkle with Crystal Ultra-fine Transparent glitter. Adhere to the card base as shown using dimensional dots. Diecut the Eyelet Border Basics die from white cardstock, sponge with dries clear adhesive, sprinkle with glitter and adhere to the card base. 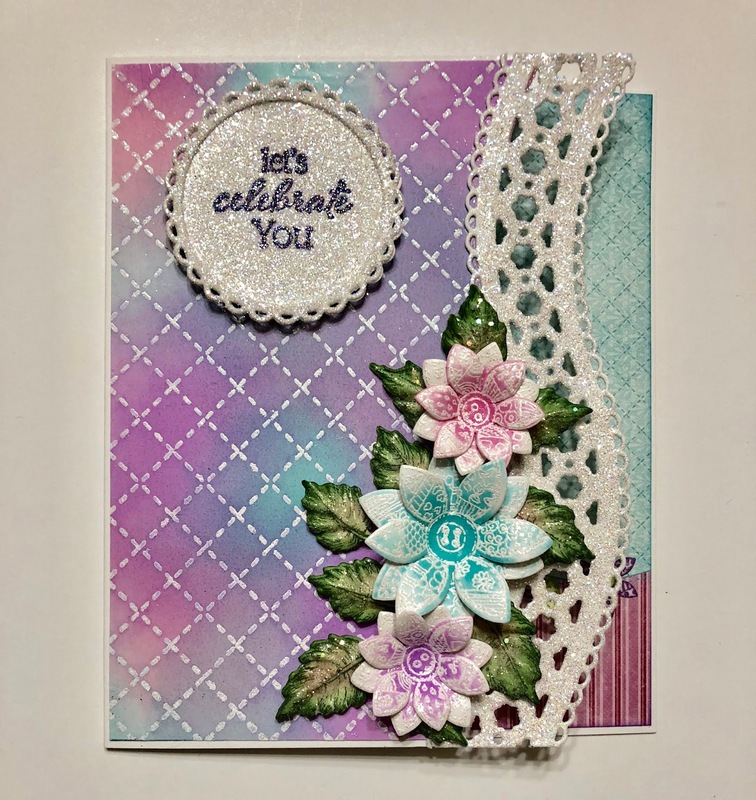 Stamp the flowers on Floral cardstock using VersaMark, sprinkle with WOW Sparkling Snow Embossing Glitter, color with Distress Oxide Inks – Wilted Violet, Picked Raspberry and Peacock Feathers, buff the color off of the embossing and diecut using the coordinating dies. Shape using the Deluxe Flower Shaping Kit. Adhere two petals together to create the flowers. 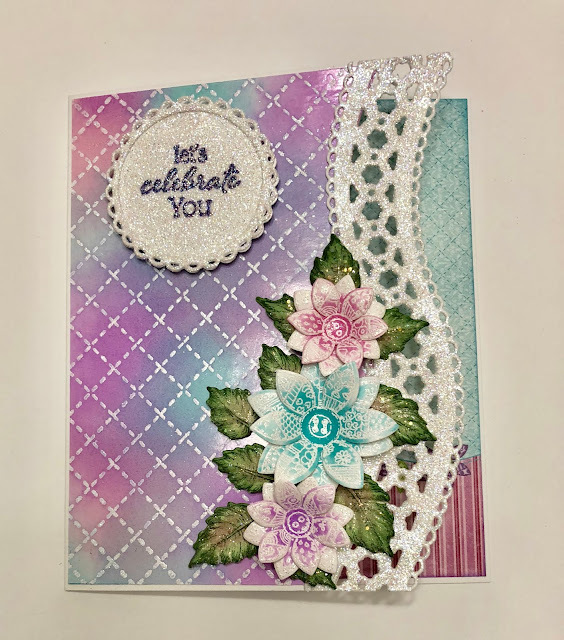 Stamp the Leafy Accents leaves on floral cardstock using Archival Olive ink, color with the same ink, highlight with a little Berrylicious ink, diecut using the coordinating dies and shape using the Leafy Accents Mold. Spray with Sparkle Sheer Shimmer Spritz and let dry. Sponge with dries clear adhesive and sprinkle with Rajni Chawla’s Crystal Clear glitter. Be sure to stop by the Heartfelt Creations Blog to see all of the beautiful projects created by the fabulous design team! Till we meet again, have many beautiful days! Absolutely gorgeous card. I love how you have done the inking and your flowers are stunning sitting on the gorgeous glittery border!! I just LOVE the way you did the bg on that bg stamp!! This card is just beautiful! !